Security is being tightened across Russia in the wake of two suicide bombings in as many days in the southern city of Volgograd that have killed over 30 people and injured dozens. With the Olympic Games set to commence in less than six weeks in Sochi, a city located just a few hundred miles from the site of the attacks, this most recent stint of violence is causing added anxiety. High profile suicide bombings throughout Russia in recent years have heightened concern about such violent extremism among the Russian public. When asked about eight potential threats to their country, Russians said that Islamic extremist groups pose the biggest danger according to a Spring 2013 survey by the Pew Research Center. 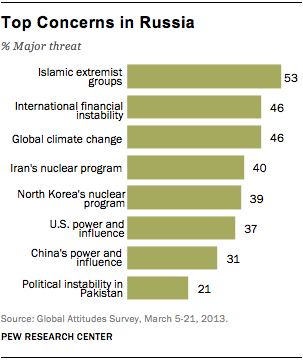 More than half (53%) claimed such groups were a major threat, trumping other potential dangers such as international financial instability (46%) and global climate change (46%). Women (57%) were more likely than men (49%) to consider such extremism a major threat.